Every day on average in the Southern California area, Ocean Blue responds to four emergency HAZMAT situations—which amounts to over 30,000 HAZMAT spills in the last 24 years. We are the most experienced & well-equipped emergency responder. Our personnel are experienced in responding to spills on both land & water. Project Manager Ed Acosta responding to a Facility chemical fire running 1 mile into the local channel. Ocean Blue caters to government clientele. We are transparent, fast & thorough. We respond to any spill, big or small in the Southern California area. On land and/or water. Ocean Blue responding to a spill at a local airport. Ocean Blue responds to just about any Hazmat spill. Below are some examples of different spills we respond to. Through the utilization of the most modern emergency response equipment and highly trained personnel, Ocean Blue responds quickly & professionally to wide varieties of emergency and non-emergency spill situations. Ocean Blue is known for fast and exemplary service. Clientele simply make one phone call to our dispatcher, and we respond with a Supervisor & crew within minutes, to any situation, on land or water, 24 hours a day, seven days a week. When there’s a spill we understand time is of the essence. 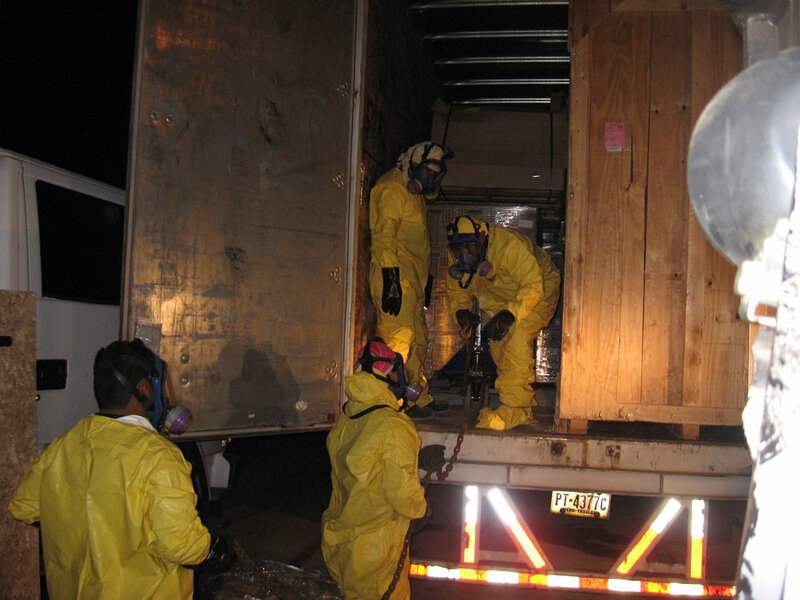 We also understand initial containment is critical to spill cleanup. To ensure we are always ready to respond, our workforce employs the most 1st-responder supervisors in Southern California. All supervisors drive their own utility trucks, which they take home. Supervisors will respond directly to the spill site, not via Ocean Blue’s yard. All our supervisors carry sandbags, sorbent materials, brooms and shovels to assist in containing the spill. All managerial resumes are available upon request. Our towable fleet of pressure washers, air compressors, light towers, arrow boards, trailers, decon stations etc. With years of field experience and the most current safety equipment available, Ocean Blue provides clients with a safe, cost-effective confined space program. The National Institute for Occupational Safety & Health (NIOSH) estimates that millions of private industry workers may be exposed to various hazards while working in confined spaces. Confined space entries may possess one or all of the “big three” confined space hazards – oxygen deficiency, toxic materials, and fire/explosion conditions; in fact, most injuries occur during rescue. Ocean Blue has established a safety program in accordance to 29 CFR 1926.21, 29 CFR 1910.146 and NIOSH 80-106 for identifying and evaluating confined spaces to determine acceptable entry conditions. All field personnel provided by Ocean Blue are fully trained for work in confined space and in atmospheres immediately dangerous to life and health.